Raw Spice Bar is a subscription box where you receive 3 different spice blends every month. The spices are centered around a monthly theme and they try to bring you the most authentic spice blends used around the world to create dishes you otherwise wouldn’t have tried. All the spices are ground just days before being shipped out. Shipping: FREE to US. Check the Raw Spice Bar site for international rates. 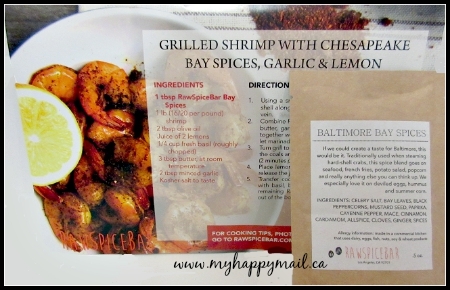 The theme for August 2015 was The Baltimore Spice Box RawspiceBar included their take on the classic flavors of the Chesapeake – complete with the brightness of paprika, herby tang of celery seed, and slow burn of cayenne. Baltimore Bay Spices are traditionally used when steaming hard-shell crabs, this spice blend goes on seafood, french fries, potato salad, popcorn and really anything else you can think up. RawSpiceBar suggests trying it on deviled eggs, hummus and summer corn. We received the Grilled Shrimp recipe which looks amazing but they also have a Baltimore Crab Cake recipe on their website that looks pretty good. The Vert Pickling Spice is a classic pickling spice that merges classic dill seed and black peppercorn with red pepper flakes for heat plus mustard seeds and coriander for warmth. 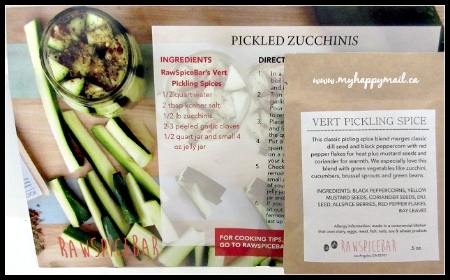 RawSpiceBar suggests trying this blend with green vegetables like zucchini, cucumbers, brussel sprouts and green beans. The zucchini recipe will take about 3 weeks to pickle, I’m not sure if other vegetables would take longer. I’ve never made my own pickles before this recipe intrigues me. 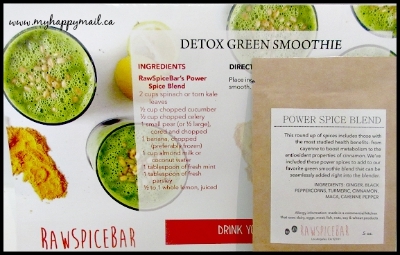 The Power Spice Blend that was included in the August box is a round up of spices includes those with the most studied health benefits RawSpiceBar has included these power spices to add to your favorite green smoothie. Included in the spice mix are Turmeric, ginger, black peppercorns, cinnamon, maca and cayenne pepper and each spice has amazing health benefits. Turmeric – is a well known anti-inflammatory spice it’s recently been found that turmeric has “antioxidant, anti-inflammatory, antiviral and antibacterial properties. Ginger – Ginger has been used as a traditional medicine to treat stomach upset, headaches, and infections. Cinnamon – cinnamon has been shown to have anti-inflammatory properties that can help ease swelling. Cayenne Pepper – cayenne pepper can help speed up metabolism and suppress appetite. Some of these spices are pretty strong I’d add just a little at a time to the smoothie so it’s not too overpowering. What do you think about RawSpiceBar? You can click HERE to visit their website to subscribe or learn more. You can click HERE to read my last Raw Spice Bar Review. Disclosure : This post contains affiliate links. All thoughts and opinions are my own. I’ve never heard of this. Sounds great! Ooohhh, this looks awesome! My brother in law would love this. Christmas present sorted! Thanks. I’ve been thinking about subscribing to the spice box. Thanks for your review. It helps me decide. Wow very cool! I haven’t heard of a subscription box that sends out different spices before, but I can see why this would be a hit. Great review! I love spices!! At home I always had a pantry full of spices – paprika, cumin and cinnamon are my favourites. Here in Cambodia I don’t cook as much and haven’t got as big a range. But I miss experimenting with different spice mixes. 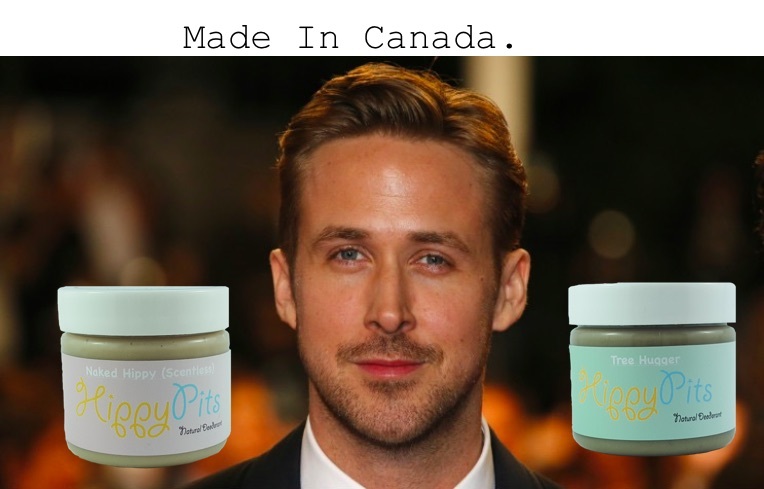 I have never heard of maca. Will have to look into it. Spices add so much flavour to dishes. I Love Cinnamon it’s so versatile and can be used in both savoury and sweet dishes. 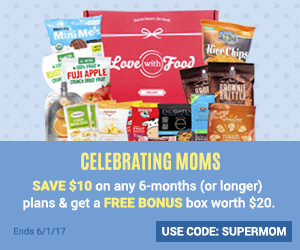 I’d never heard of Maca either until this box. This sounds like a cool idea. I don’t think this month’s box would have been for me though; lost me at celery seed. I don’t know, something about celery is just unforgivable to me. Including recipes is a great touch, sounds like a good company. This looks awesome! Haven’t heard of this box yet. Thanks! It’s a really great way to mix it up in the kitchen! Perfect! I love to experiment with the different spice blends.